Yahoo! is redesigning and rebuilding from the ground up its popular instant messenger (IM) client Yahoo! Messenger for Windows Vista. The new version of Yahoo Messenger with face lift which is specifically developed and optimized for Windows Vista to take advantage of the enhancements to new operating system user interface which has been beautified and made more attractive. Beside, some new features in Y!Meseenger is built based on new GUI (graphical user interface) development framework in Windows Vista called Windows Presentation Foundation (WPF). Instant message, voice, webcam video, and more. Use the integrated Yahoo! Messenger Sidebar gadget to keep up with the friends that matter most. 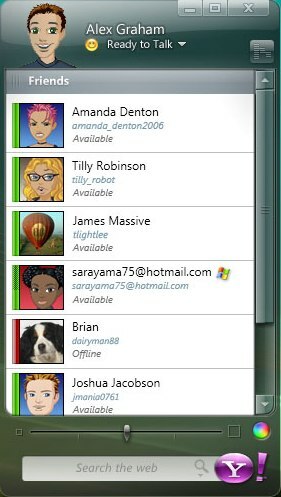 Also add Windows Live Messenger friends to your contact list to see when they’re online and IM them. Keep conversations organized by dragging and dropping them into one tabbed window. Brand new emoticons, program icons and alert sounds. Automatic groups are created in your contact list based on your Yahoo! interests (i.e. Yahoo! Sports Fantasy Football league). Ability to scale up the size the avatar and contact information for people or buddies in a user’s contact list. A color wheel that allows users to choose a new color for Messenger’s skin. Ability to show over-sized emoticon that goes beyond the boundaries of the Messenger window before shrinking to its normal size all using WPF. Yahoo Show and Tell that allows users who are connecting or chatting via voice on Messenger to share photos without interrupting the call. In other word, Y!M users can converse or send IMs (instant messages) or images (support for video sharing will be added in future) while they are talking. Tabbed instant message windows or chat windows, just as in other alternative popular instant messenger clients such as Trillain (not actually tabbed chat windows but Trillian tabbed containers), Gaim (tabbed conversations), Miranda IM (use add-ons to enable chat window tabbed interface), or AIM Messenger (with add-ons). It’s exactly the same with tabbed browsing feature in IE 7 and Firefox web browsers. Tabbed chat windows allow users to more efficiently keep track of their chat sessions or instant messages. The application does not automatically create tabs as some IM software does, but users create the tabs themselves so they have control over which conversations they would like tabbed. New “voice visualization” feature to Yahoo! Messenger where Windows Vista users can see their voice on the IM window coming through as a visual sound wave, directly helping IM users to determine and know if the person they are speaking to can hear them and if their voice is at an appropriate volume level, as well as to make the connection between users a more “intimate” experience. Yahoo Messenger for Windows Vista Video Preview Clip, also available a Flash Video at http://messenger.yahoo.com/vista_popup.php (no longer available). The Windows Vista version of Yahoo Messenger is scheduled to release on second quarter of 2007 firstly as a beta download, with final version of Vista Yahoo Messenger available for free download four to six weeks after the beta release. More information can be found at Yahoo! Messenger for Windows Vista preview website.